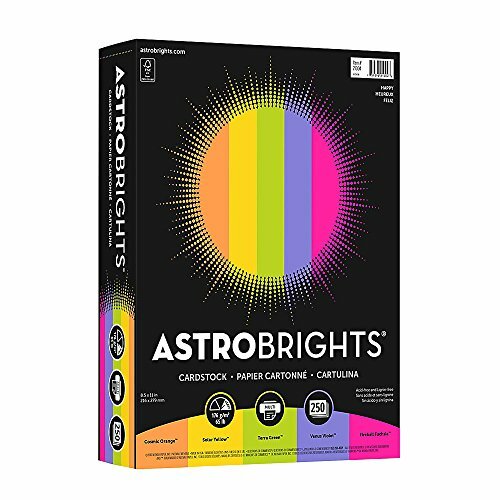 Let your imagination take off with Astrobrights Colored Cardstock, in "Happy" 5-Color assortment. Creative geniuses and novices alike can create dazzling postcards, booklet covers, presentation bindings, and paper crafting. Our colored card stock is thick enough to stand up to frequent handling and the rigors of postal machines, yet smooth enough to work with inkjet and laser printers. Plus, it's lignin and acid-free so it won't yellow over time. With more colors, the possibilities are limitless! Bright Colors, Brighter Ideas. 250 colored cardstock sheets; 50 of each color; Size: 8.5" x 11"